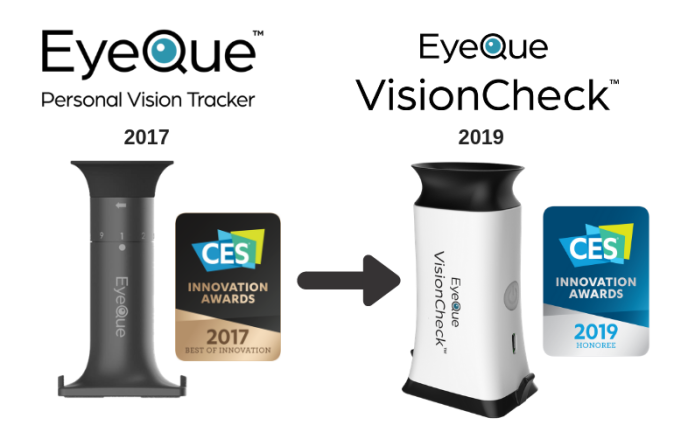 EyeQue is proud to announce that the VisionCheck Indiegogo campaign was a huge success! We love launching our new products on platforms like Indiegogo to give early adopters a preview and start a valuable dialogue with new customers. We reached 578% of our $25,000 goal, raising a total of $144,926 from 2,487 backers. That’s evidence to us that VisionCheck will make a lot of people very happy come March when we deliver the first devices to our backers. VisionCheck is available for pre-order from our website, and the Indiegogo “InDemand” platform. Pre-orders placed after January 18 will begin shipping in April 2019. Here’s the full product story that we shared on Indiegogo. 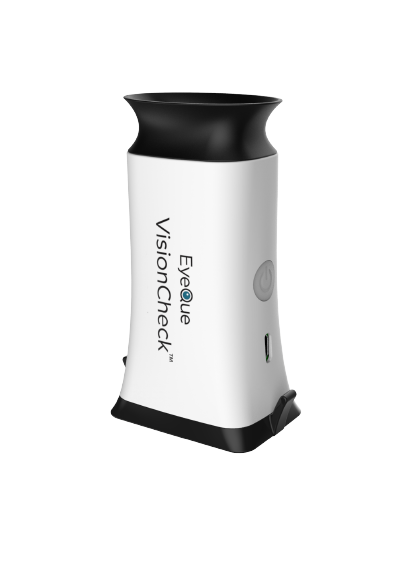 EyeQue VisionCheck is a refractometer that measures your refractive error, i.e. your nearsightedness, farsightedness, and astigmatism. The tests show results in the same format as your prescription, allowing you to order glasses online. The VisionCheck includes a patent-pending pupillary distance (PD) measurement tool, called the PDCheck, that accurately captures your PD in a matter of seconds. 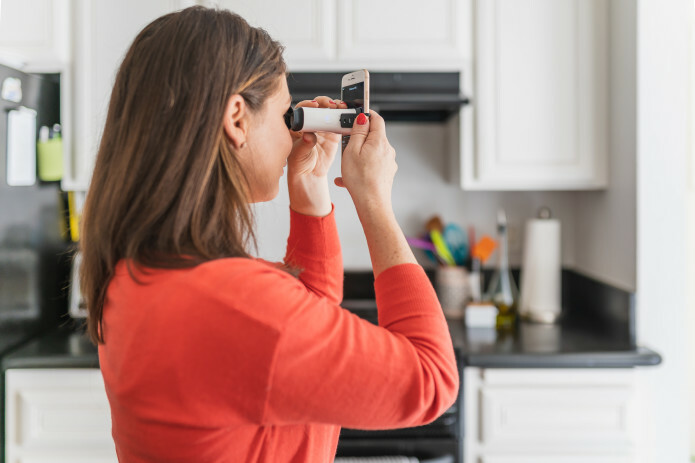 At-home vision testing, powered by your smartphone. 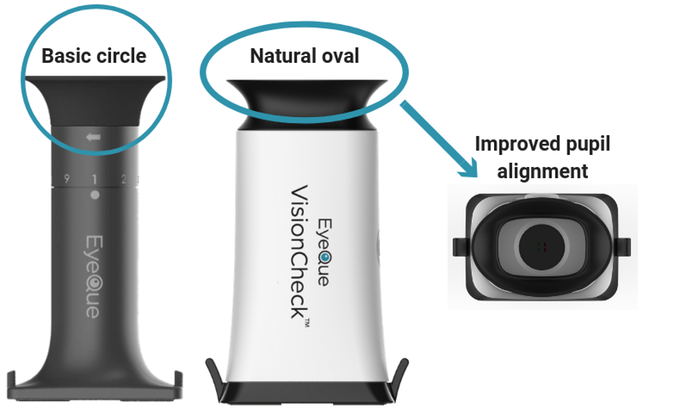 EyeQue VisionCheck is a refractometer that measures your refractive error, i.e. your nearsightedness, farsightedness, and astigmatism. The tests show results in the same format as your prescription, allowing you to order glasses online. The results will also include your estimated near-vision add (NV ADD+), needed to purchase reading or progressive glasses. 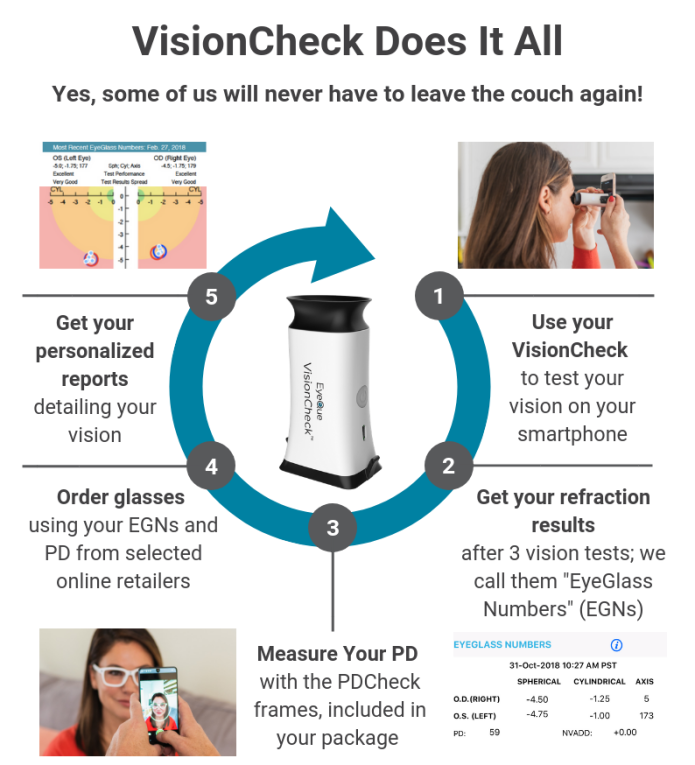 The VisionCheck includes a patent-pending pupillary distance (PD) measurement tool, called the PDCheck, that accurately captures your PD in a matter of seconds. We gave over ONE THOUSAND demos of the VisionCheck over the course of 4 days. Check out what people are saying! 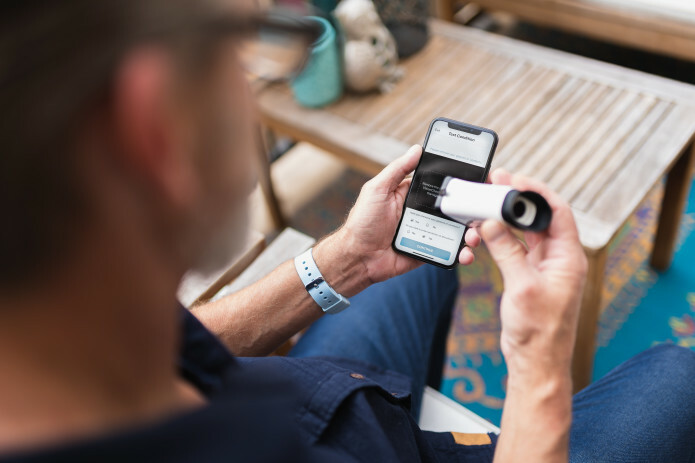 The EyeQue VisionCheck’s development is based on our first product, the EyeQue Personal Vision Tracker, a manual refractometer that launched on Kickstarter and Indiegogo in 2017. Having received over 4500 pledges, our technology was also nominated for the prestigious SPIE Prism award; referred to as the Oscars of the optical industry. Over the past two years, our patented technology has shown unprecedented accuracy and received praises from many of our users. Check out our testimonial section below! 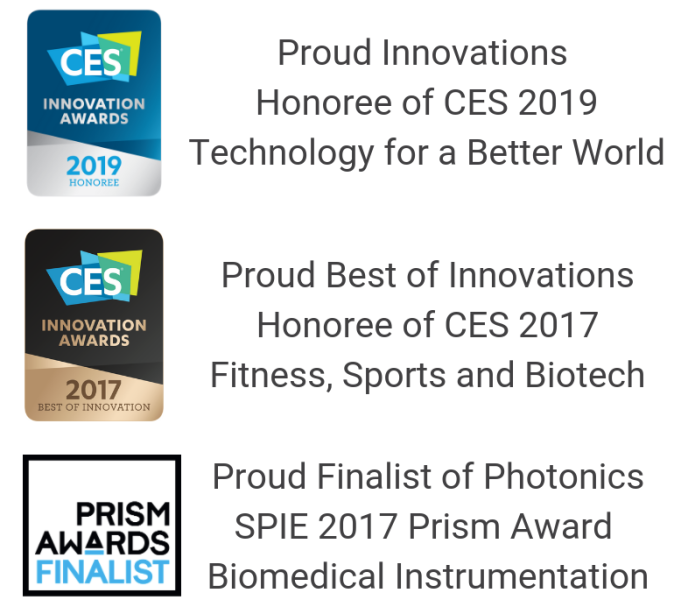 CES has honored us with not one, but TWO CES Innovations Awards in 2017 and 2019. Save money: The EyeQue VisionCheck is inexpensive (MSRP $59.99) compared to your typical office visit and can be shared with many persons. All of our products are supported through annual memberships, currently starting at $4.99 per year. Each membership enables unlimited usage of all EyeQue vision-testing products, ranging from $29.99 to $89.99. 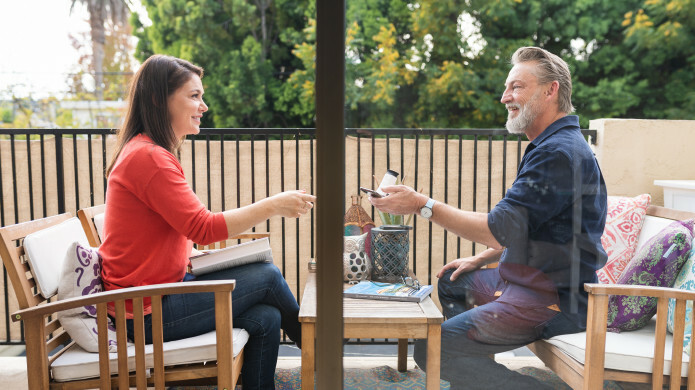 Save time: Unlike traditional office visits that you make once a year, you can use the EyeQue VisionCheck anywhere, anytime. All you need is a smartphone and an active internet connection. No need to schedule ahead, drive through traffic, and wait at the office only to sit through boring lectures or sales spiels. In comparison, each VisionCheck test takes about 5 minutes to complete once you understand the process. Most first-time users get great results after taking 3 or 4 tests, usually under 30 minutes in total. EyeQue is hassle free and gives back hours of your valuable time. More accurate than a single point-in-time refraction test: Since your vision fluctuates throughout the day, taking multiple tests at different times of the day gives a better average refraction than a one-time refraction test during an office visit. Especially if someone is having a bad day! 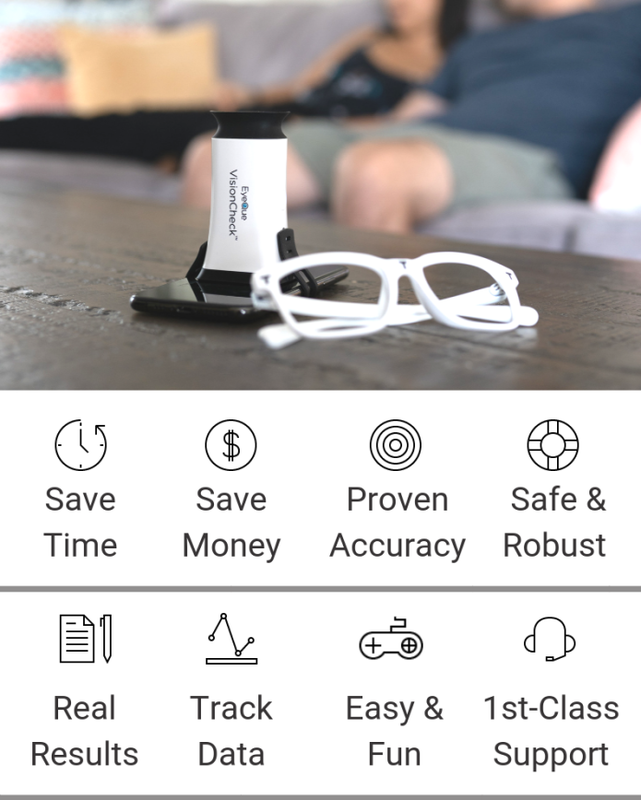 The MIT-patented technology powering the VisionCheck has been extensively tested with over 12,000 users over the past 2 years and has been optimized to give excellent refraction values for ordering eyeglasses. Real tests, real results: Unlike other online vision tests, VisionCheck gives you a true refraction measurement. These results are called “EyeGlass Numbers” (EGNs). We do not simply request and renew your prescription. 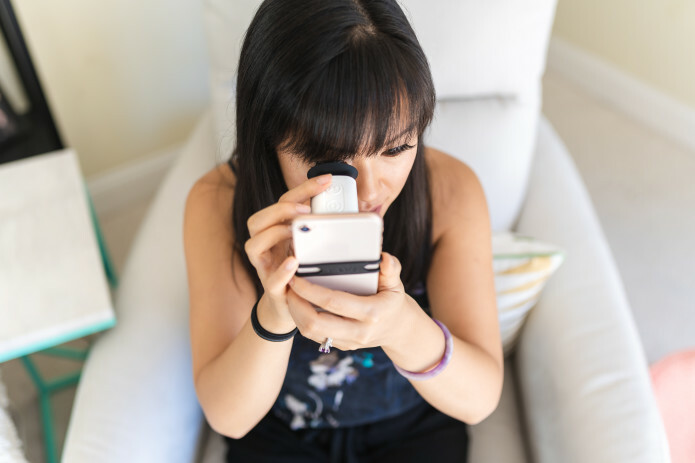 EyeQue products ACTUALLY test your vision and generate real scientific results. Also, there’s no wait time; you get refraction results (EGNs) immediately after you complete three refraction tests. See your data, use your data: Your personalized dashboard can be accessed through your EyeQue account and contains a multitude of information about your vision. This includes detailed reports showing and explaining your results, as well as the consistency of your testing. The report even compares your vision results with the general EyeQue population! Use your most updated EyeGlass Numbers (EGNs) to order glasses online from trusted retailers or share them with your eye care provider. Safe & robust: VisionCheck uses only the illumination from your smartphone screen, filtering the light making it completely safe for your eyes. The VisionCheck device is rugged yet beautifully designed. Internal elements of the device are enclosed in a solid injection molded plastic housing while the precision optics are made from the highest grade polymers; the electronic components are commercially approved as well. VisionCheck has undergone extensive environmental testing including drop, temperature, humidity, and shock tests to ensure that it is safe and robust enough for household use. VisionCheck is registered with the FDA as well. 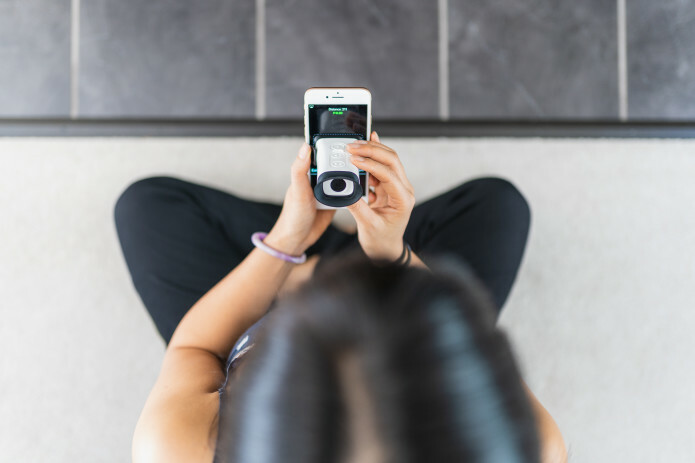 Fun and easy to use: Simply launch the app, attach the VisionCheck device, and use the touch sensor buttons to perform a series of game-like actions to overlap the red and green lines as you look through the device. Voila, you get your refraction results in the form of EyeGlass Numbers, instantly. Voice guidance is also available, making it even easier to use. Seriously amazing support: Our success is based on your satisfaction, and we are committed to providing responsive solutions to meet your needs. Some of our members have described us as obsessively customer focused, a compliment that makes us smile. Typically, we respond to any email requests within 24 hours. We also have an online chat service to work through any issue you may be having. Our support staff are in-house professionals that work closely with our software and optical engineers. We also have an extensive database of educational content on vision and health, called “Knowledge Center”, which can be accessed on our website anytime. We are mindful of your privacy and security. We use HIPAA compliant processes and cloud storage for all your EGNs and personal data. We do not share your information with any organizations for any purposes, EVER. 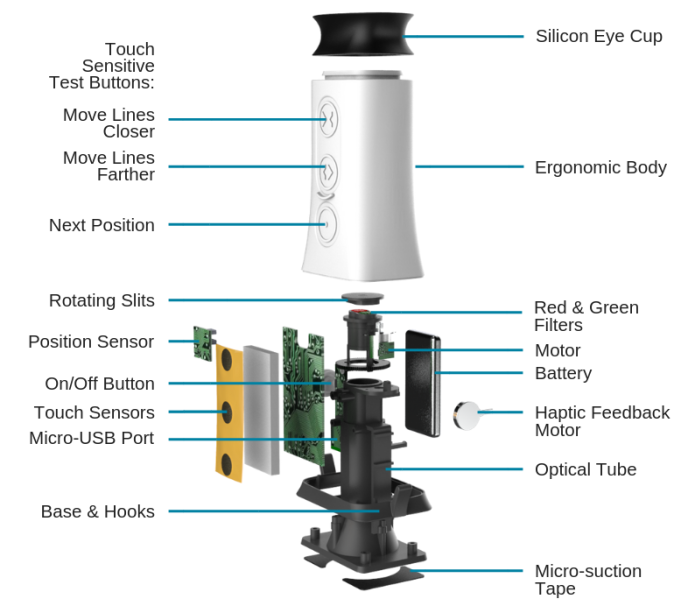 Below is an “exploded view” of the patented VisionCheck device. It is a precision optical instrument built with micron-level tolerances. Substantial engineering effort was required in order to build reliable devices on a mass scale. To achieve that, we have employed a team of exceptional industrial designers, mechanical, electrical, optical, and firmware engineers. The VisionCheck is based on an MIT patented technology licensed exclusively to EyeQue. This technology has been extensively tested in our 1st generation product, the Personal Vision Tracker and uses a variant of the inverse Shack-Hartmann effect. The device projects two parallel beams of light that comes from the smartphone display into your eyes and onto your retina. 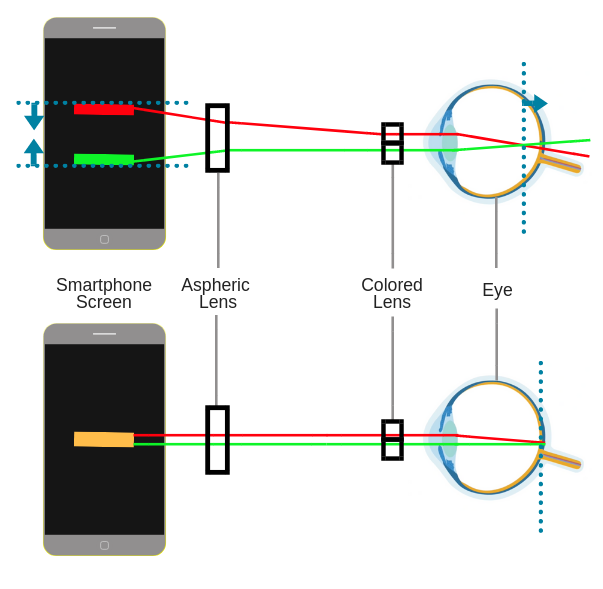 The beams of light come from red and green lines formed by illuminated pixels on your smartphone, separated by 2.5 mm when they leave the device so that they can fit through your pupil. Using an interactive touch-sensitive interface, the user overlaps the two lines to form what looks like one yellow line. 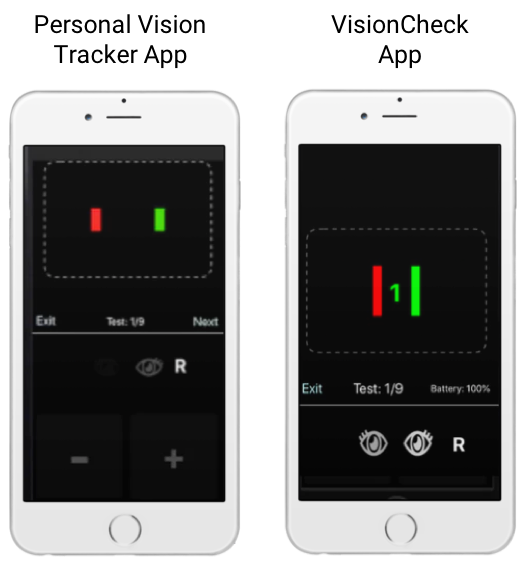 Based on the amount of pixel movement made, EyeQue calculates the user’s refractive error in that particular direction. The device then rotates the lines to another angle and you repeat the measurement. Measuring the refractive power over a number of different angles gives the sphere, cylinder, and axis needed to correct your vision with eyeglasses. The method works for most people who are willing and able to follow the instructions we provide. We cannot explain the science without explaining the human eye first. Nearsightedness, farsightedness and astigmatism occur when the eye lens and eye distance are “out of synch”. Normal distance vision is the result of the light entering the eye and focusing exactly on the retina, where the brain interprets sharp images. Common deviations from normal vision, nearsightedness, or myopia, occurs when the lens focuses the light before your retina; Farsightedness, or hyperopia, occurs when the lens focuses the light past your retina, both causing the brain to interpret “blurry” images. Almost 50% of the human population has some degree of nearsightedness, farsightedness, or astigmatism. These conditions are also known as “refractive errors”. 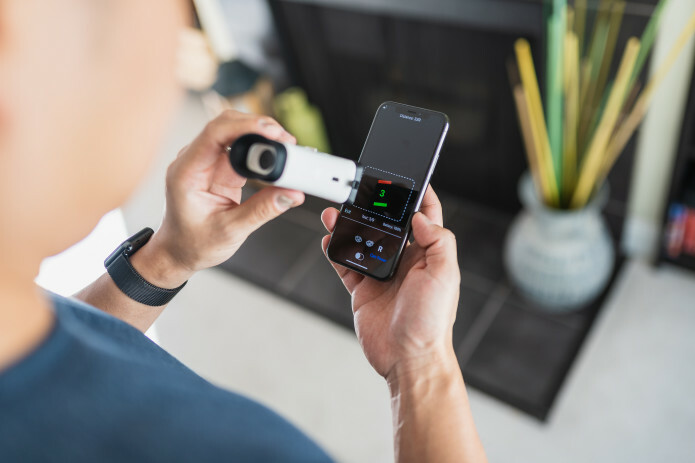 The EyeQue VisionCheck is an optical device that achieves the effect of a variable corrective lens as it translates pixel spacing on the smartphone screen to corrective powers. To simulate the effect of converging or diverging rays into your eye that a correction lens would provide, you simply move the pixels on the screen closer or further emulating the effect of a corrective lens; overlapping the red and green lines and creating a single yellow line. Think of the VisionCheck as a custom converter of pixel spacing to optical power. 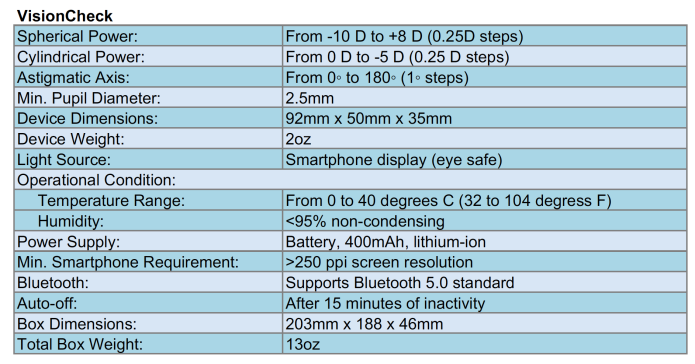 Using that conversion, VisionCheck can determine corrections from + 8 D to – 10 D.
VisionCheck uses your smartphone’s display to work; with a pixel spacing on the order of .07 mm (70 microns) or better– comparatively, about the diameter of a human hair. VisionCheck works well for phones down to 250 Pixels per inch (PPI). Any PPI below 250 means that the resolution is too low for it to be optometrically accurate. The iPhone6s, for example, has an adjacent pixel spacing of 21 microns, and about 63 microns between same color pixels. With this small pixel spacing, VisionCheck exceeds 0.25 Diopter resolution. As a reference,0.25 Diopter accuracy is the level typically achieved by Optometrists. 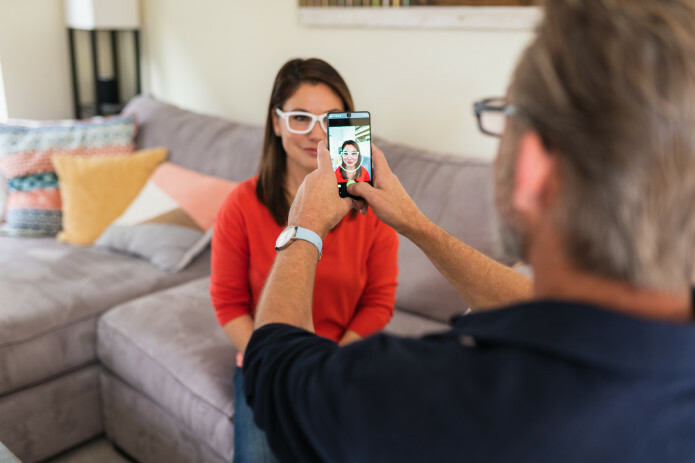 While it is easy to understand how EyeQue can measure the overall optical power for nearsightedness and farsightedness, VisionCheck also gets an accurate measurement of astigmatism by sampling over different angels. To measure astigmatism, a complete set of power measurements is comprised of 9 measurements for your right eye and 9 measurements for your left eye. Measurements are made at increments of 40 degrees and with these measurements, the astigmatism is computed. Yes, that’s a lot of measurements but the device is making measurements of tiny differences that reflect the shape of the eye lens and cornea. About 1 diopter of astigmatism, a typical value implies that the non-spherical component of the eye is about 0.25 mm. 0.25mm is thinner than your average ball-point pen point. All computations are carried out in the EyeQue cloud as it takes a substantial amount of computation that is dependent on many different parameters including the smartphone you are using. As you take more tests, the results are aggregated together through averaging and removing bad data points. Each test is scored based on the goodness of the computed fit to the measurements. An example of test results is shown below. Along with your test results, we also provide you with a measure of the consistency. The plot on the right also shows how other users have performed as shown by the relative size of the blue dots; most but not all users fall into the “good” category. Our personalized vision report is a great way to stay in touch with your test results and vision changes. VisionCheck includes another cool test called PDCheck™. Accurate measurement of pupillary distance, PD, is necessary to order prescription eyeglasses. If the measured PD is wrong, you will find the glasses uncomfortable and it will make you feel dizzy. Our patented PDCheck technology uses the smartphone camera to take a “selfie” and extracts the PD to an accuracy of +/- 1 mm. There are a lot of mobile apps out there that have you use a credit card or paper printout held against your forehead .… these simply do not work well due to many factors. PDCheck includes a special set of PD frames with patented T marks on the frames that provide an accurate reference point to determine the distance between the center of your eyes. The great thing about the PD frames is that by wearing them, your hands are free to get a great selfie. 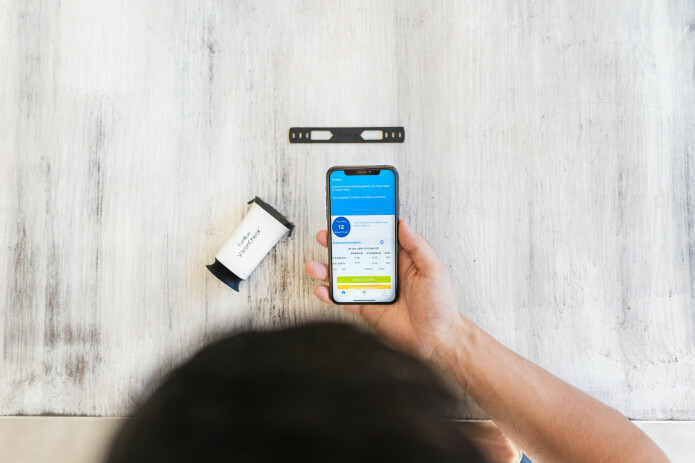 PDCheck works with both the front and rear facing cameras of your phone, so you can either measure your own PD or have someone else measure your PD by just taking a picture. 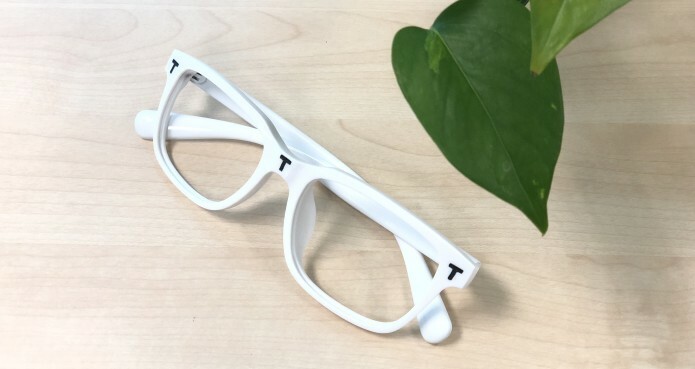 The PDCheck app uses image processing to detect the T marks and the pupils of your eyes; it will only work with these special frames. If you are not using the frames the PDCheck app will not give you a PD measurement. 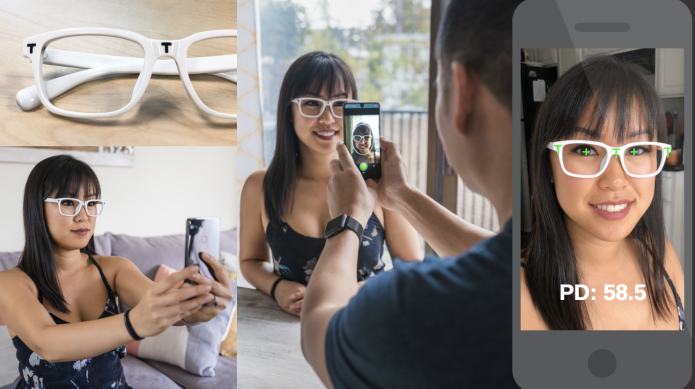 Once you take the selfie you can tweak the positions of the cursors a bit to make sure they are in the location that best matches the T’s and center of your eye. Adjust the markers to the center of your pupils and T marks (if needed) to get the most accurate PD. For privacy reasons, the selfie image is not saved or uploaded anywhere. 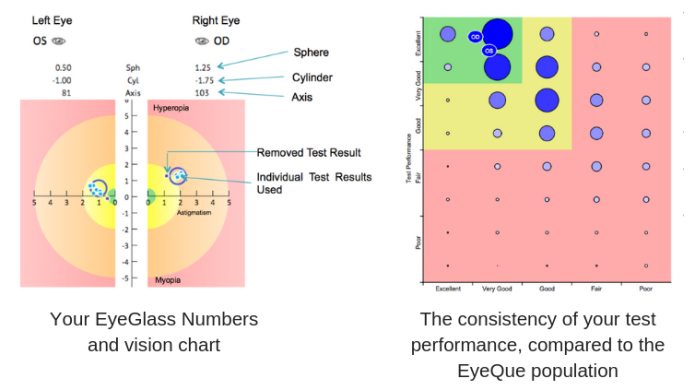 We just compute the relevant parameters needed for an accurate PD and upload those values, not the image, to the EyeQue Cloud®. The PD then becomes part of your EyeGlass Numbers and will display on your dashboard. 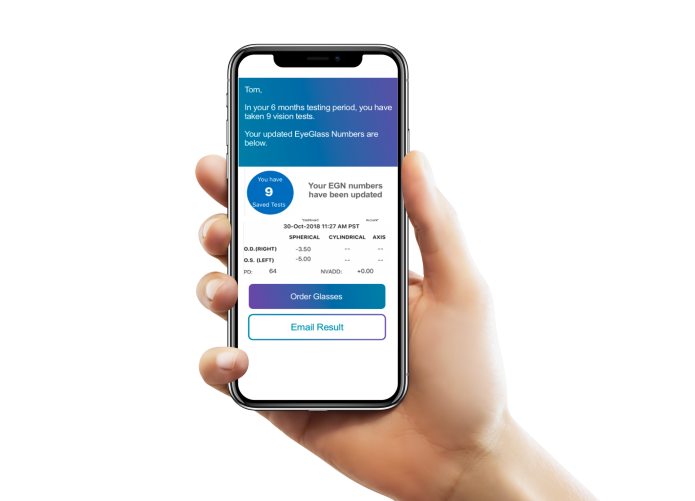 Since your test results are uploaded into the secure EyeQue Cloud®, it allows you to access the data immediately, from both desktop and mobile. 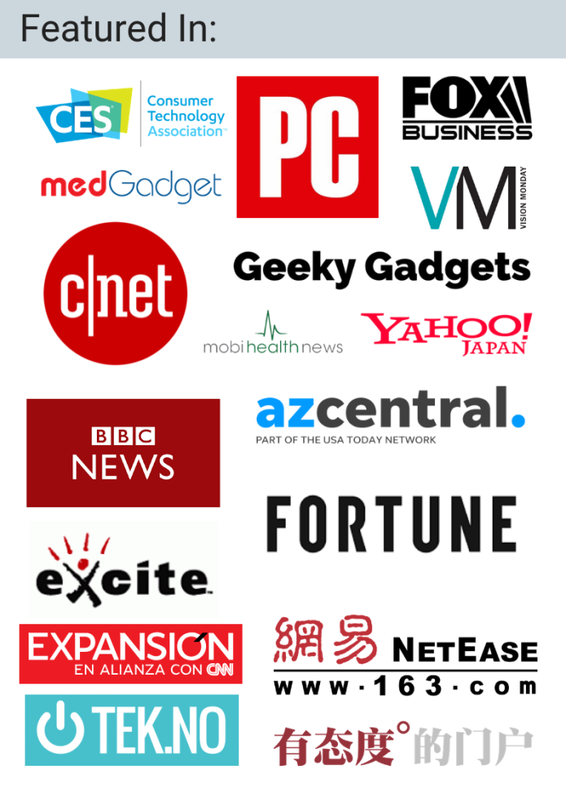 See what our users say about our 1st generation product, the Personal Vision Tracker. 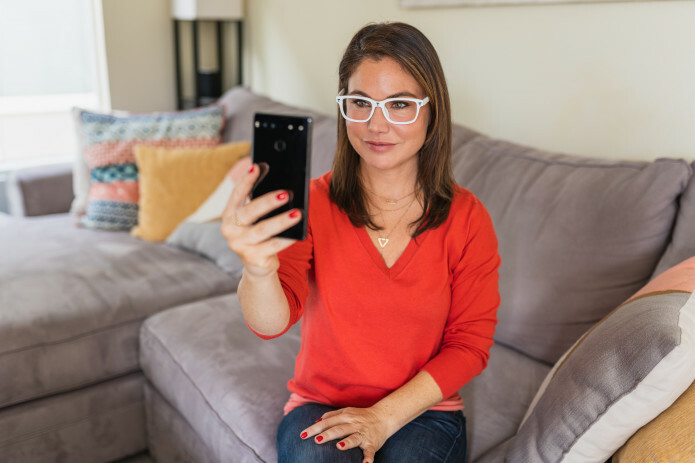 In a recent survey, 90% of those who’ve purchased glasses using their PVT-generated EyeGlass Numbers say they are the same or better than their previous prescription glasses. VisionCheck is a substantial improvement over our original product. Paul Gibson is an optometrist based in the U.K. These are real quotes from real customers. See MORE testimonials here! 1. Download the app for the EyeQue VisionCheck from either the Apple App or Google Play Store. First-time users will be required to register for an EyeQue account while current EyeQue user can log in and complete a short on-boarding procedure. During the process, you’ll need to use the serial number to activate VisionCheck app. 2. Attach the device to your smartphone, logos facing down, buttons facing up. secure the device with the elastic band. 3. Overlap the red and green lines by tapping the touch-sensitive “closer” and/or “farther” buttons on the device. Once you are satisfied that the lines are overlapped, tap the “next” button for your next set of lines. Continue this process for all 9 positions per eye. 4. In 3-5 minutes, you have your vision results! (The more tests you take, the better your results will be). Generate your EyeGlass Numbers by taking 3 or more vision tests. You can even email the results to yourself or your eye care provider. 5. Use the PDCheck to get your PD measurement in seconds. 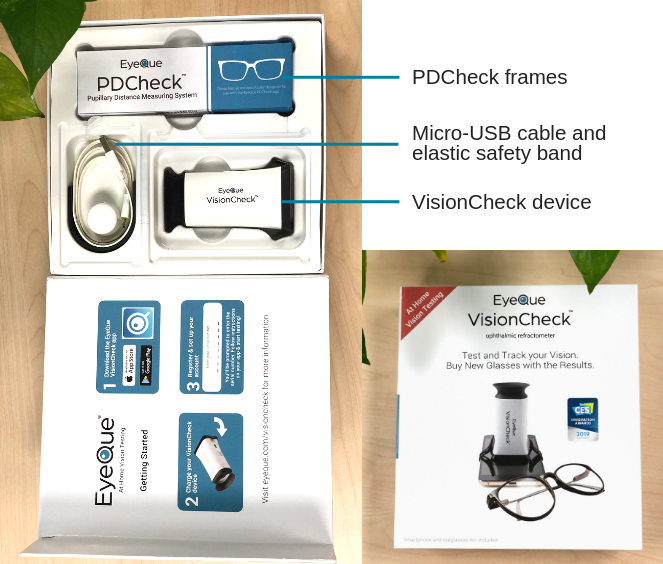 Put on our patented PD frames (included with your VisionCheck!) and take a picture of yourself; either in a selfie or with the help of others. 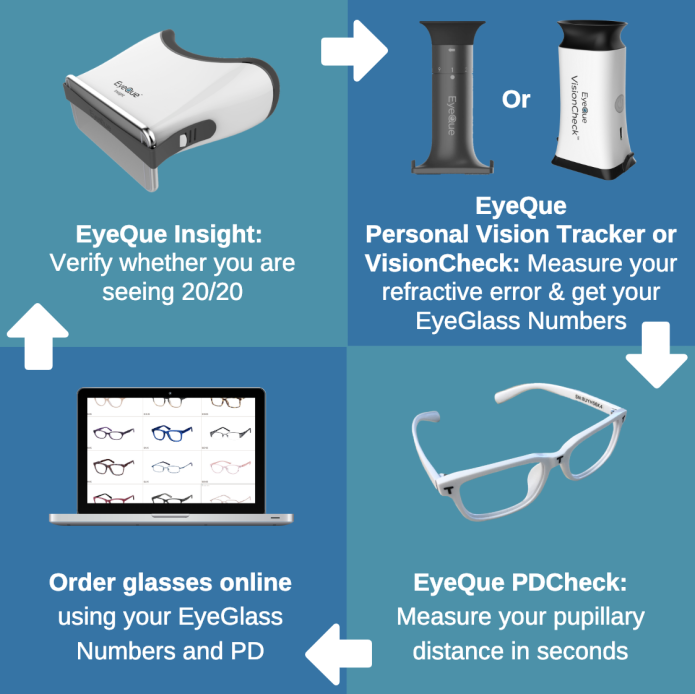 EyeQue has a family of vision testing products, each complementing another. Many factors were considered in the design of the VisionCheck. 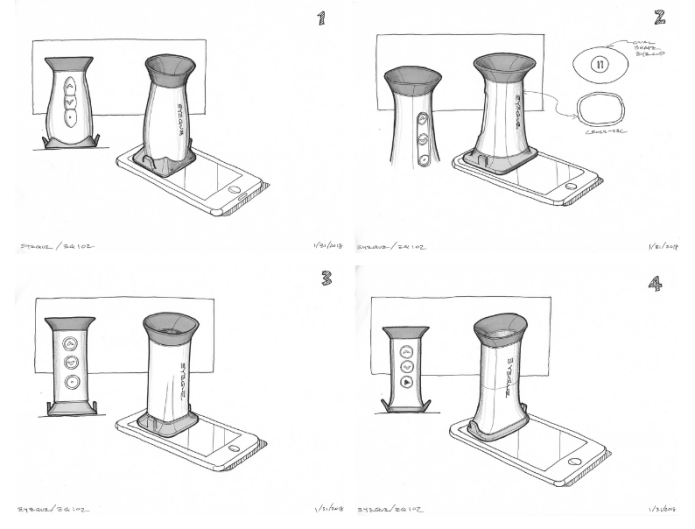 We set out to create another refraction device that was better optically, easier to use, and faster than the first-generation product but remained at a low-cost to the consumer. 1. A better optical system to allow the display lines to appear 50% larger than the lines in the previous device, making them easier to see therefore improving test efficiency and accuracy. 2. Touch-sensitive test buttons on the VisionCheck device to improve the ergonomics of the test. 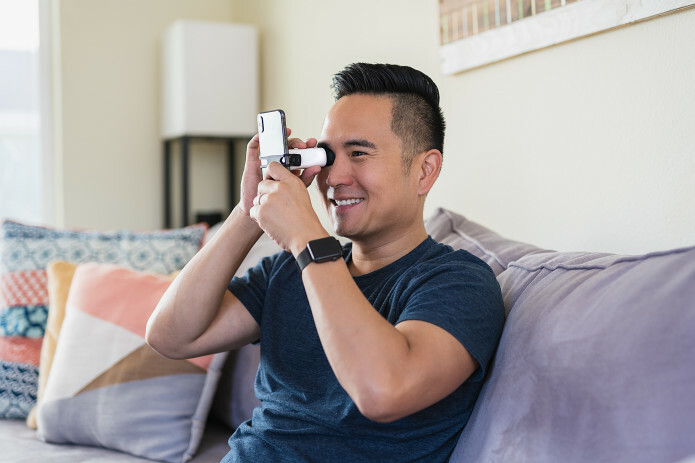 Combined with the automated screen pattern and silt rotation, the VisionCheck allows you to take the test without ever taking your eyes off the device, so you can maintain focus and completing the test faster. 3. With a the device that no longer requires manual rotation, we fitted the VisionCheck with an eyecup with a more natural shape. The natural oval shape provides superior comfort and alignment. 4. 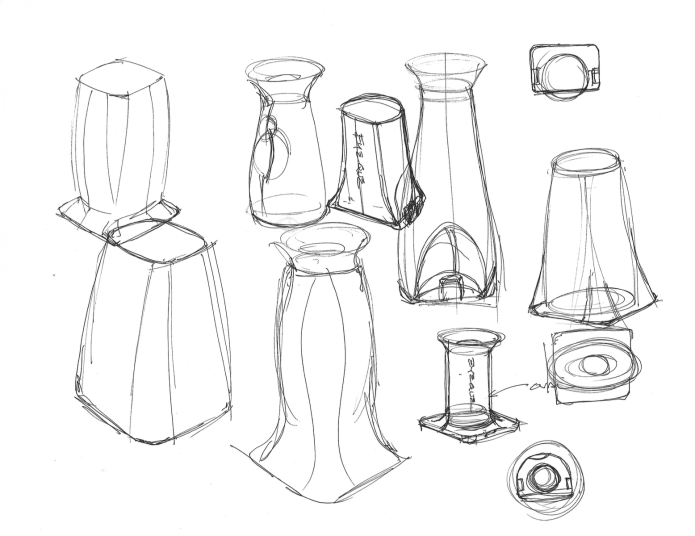 A device that is aesthetically pleasing; you can view some of the first sketches are shown below. The new housing needs to contain the electrical and mechanical elements of the device. Still have questions? Contact us or use the Chat button on the right. Don't Wait. Check Your Vision Anytime.